Note, the UART output is multiplexed over the MicroUSB port by a MAX77693 MUIC, not an FSA9485 as the XDA guide suggests. So, equipped with the knowledge I needed, I went shopping (yay!). 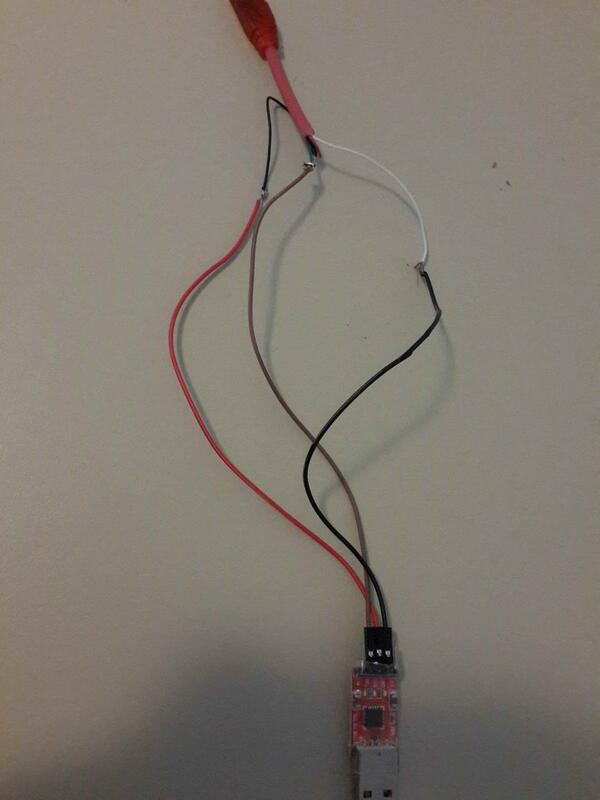 I bought a CP1202 USB-to-UART adapter, and a microUSB cable with a 523kΏ resistor. After a lot of waiting, both pieces finally arrived, and I could get hacking. I tore apart carefully cut the cable - only the microUSB end is of any use. 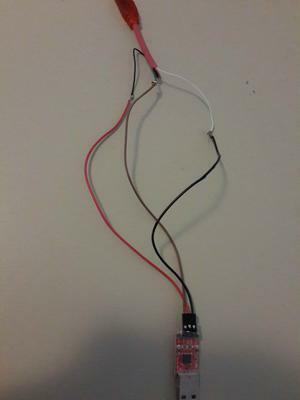 Before soldering, I thought it might be good idea to use some jumper wires (conveniently packaged alongside the UART adapter) to check that my wiring was connect. It turns out, UART is pretty reliant on having a stable ground connection (who would've thought?). Jumper cables don't make providing such a connection easy. After much fighting with the cables, I managed to get a couple of lines of semi-readable output on the UART console - the trick was to solder the USB cable connectors to the relevant ports on the UART, and to swap the TX and RX cables around. Unfortunately, at this point the UART seems to cut out (outputting �) until about four seconds into the kernel boot sequence. I have no idea why, but this means that dropping into the bootloader shell is not possible for now. So, I guess the next step is to get a mainline serial console (and more?) working.